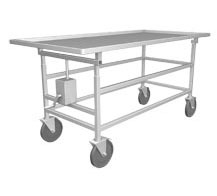 Stainless Steel Autopsy Cart Top is fabricated with a perimeter trough which allows fluid to flow away from the body and down the sides of the platform toward the drain. Unit is fabricated from 14 gauge, 304 stainless steel with a No. 4 finish. All exposed welds are ground and polished to match adjoining surfaces. The top is recessed and creased toward the drain hole. Dimensions: 32” wide by 80-1/2” long with reduced outer corners, a 1-3/4” profile with a return flange and a 2” ledge around the entire perimeter.